This strange growth on an alder cone is actually a fungus with the rather apt name of Alder Tongue (Taphrina alni). 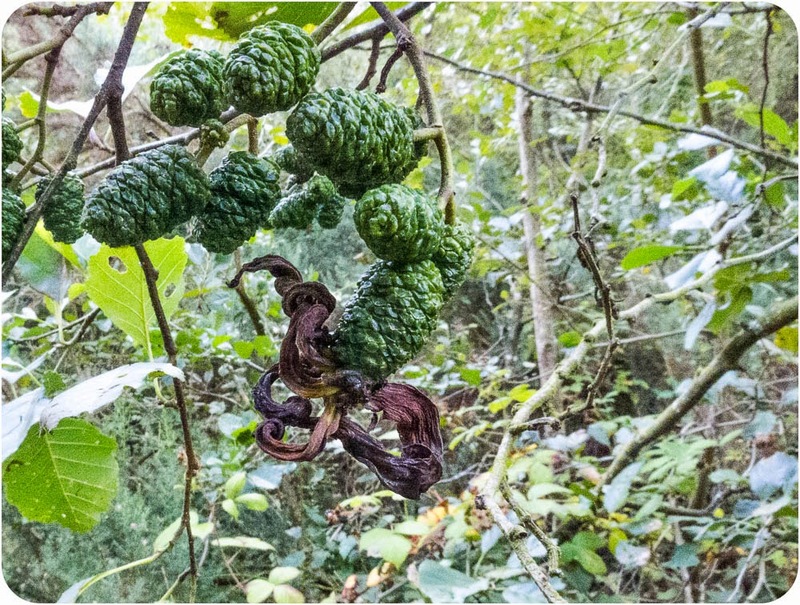 The fungus grows out of the ripening cones of alder trees, after the female flowers have been pollinated in the spring. Initially green in colour, it forms a gall that changes to orange and then dark brown as here. This particular example is from the Cynheidre Open Cast Site where alder trees abound. Once you get your eye in its amazing how many Alder Tongues you can come across. This weird fungus started fruiting at the Botanic Garden a month ago - especially around our polytunnels. There's one particular branch on an alder tree near our Aqualab that produces this fungus every year. It's a pity I didn't start looking earlier when they were in their prime! Yes quite common and widespread ---- this was hardly known until someone wrote a short note in Field Mycology (or Mycologist) then all who looked above 'ground level' saw them ! When young fb's they are very attractive.